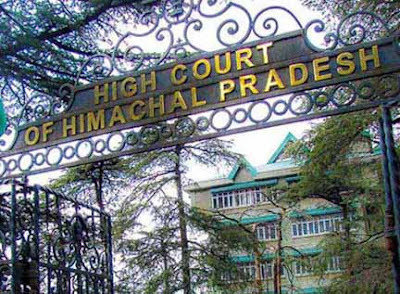 Shimla : In the matter pertaining to the encroachment of Government land in Village Chaithala in Tehsil Kotkhai the High Court of Himachal Pradesh, tody directed the parties to file fresh status report within eight weeks. The court further directed the respondents to supply advance copy of the report to advocate J.L. Bhardwaj (Amicus Curiae), enabling him to file response, within three weeks thereafter. A Division Bench comprising the Chief Justice Mansoor Ahmad Mir and Justice Tarlok Singh Chauhan passed these orders on a petition taken up suo moto by the Court as Public Interest Litigation on a letter written to the Chief Justice by a resident of Village Chaithala in Tehsil Kotkhai. The petitioner has alleged around 40 residents of villages Chaithala, Nagpuri Chaithala, Karewag Chaithala and Sevag Chaitala have raised apple orchards on around 500 bighas government land. They have felled Deodar trees on the government land and raised orchards. Some of them have even availed financial help from the government for constructing apple grading and packing house and water storage tanks. The petitioner also alleged that the government has also provided the encroachers electricity and water connections.